There is absolutely no place on earth like Hawaii. From the spiritual and natural beauty of these amazing islands, to the liveliness and diverse offerings of cultural activities, Hawaii has it all. Enjoy the fresh clean floral air, witness the inspiring volcanoes of Hilo, walk through Honolulu's Diamond Head mountain, whale watch or play on some of the most incredible golf courses ever created; There is so much to do in Hawaii. Our Hawaii cruise packages can help you see it all. Whether it be surfing for the first time, participating in a Hawaiian luau or just soaking up the sun at some of the most beautiful beaches known to man, Hawaii cruise vacations offer endless new experiences. Hawaii has six major islands for cruise passengers to visit. They are Kauai, Oahu, Molokai, Lanai, Maui and the Big Island. Each Hawaiian island provides a different and exciting perspective on Hawaii. For example, Kona The Big Island offers more of a rugged and natural landscape, where Maui offers an exciting vibe of surfers and artists all converging together. All Hawaiian cruise packages offer a new experience for cruise passengers. There are plenty of cruising options available to Hawaii. Choose from Carnival Cruise Line, Celebrity Cruises, Norwegian Cruise Line or Royal Caribbean. Each cruise line offers a different and unique experience of Hawaii. One of the most popular and highly recommended cruises to Hawaii is on the Norwegian Pride of America. NCL is the only cruise line to offer inter-island cruises to all four of Hawaii's most beautiful islands. Kauai - Kauai, Hawaii's island of discovery, offers the Napali Coast with mountain-laced shorelines, Botantical Gardens with overwhelming landscape views of boating down the Wailua River next to waterfalls and jungle terrain. Maui - Maui - the magic isle - is perfect for whale watching and tasting island cocktails. Maui's breathtaking views and pristine beaches attract travelers from all over the globe. Maui has 120 miles of beautiful coastline for tourists to surf, snorkel, walk and just explore. Oahu - The heart of Hawaii, Oahu, features world-famous Waikiki Beach, perfect for surfing, shopping and sightseeing. Travelers can choose to escape to the peace and quiet of Oahu or run off and explore the natural wonders of this beautiful island. Kona - The Big Island is said to be the island of adventure. Swim with the manta rays or if you are feeling really adventurous, explore Hawaii's Volcanoes National Park. When you are ready to relax, visit Kona's coffee plantations and sip and savor some of the best coffee in the world. Lanai - Lanai's famous Hulope Bay has white sandy beaches and aqua blue water, making it a perfect spot to explore the local marine life and tide pools, snorkel or scuba dive. Prepare to lose yourself in one of Hawaii's most exciting islands. CLICK HERE TO VIEW THE LATEST DEALS ON ALL HAWAII CRUISE VACATIONS! Book your Hawaii Cruise vacation through the experts at HawaiiCruises.Travel. By booking your Hawaiian Cruise through HawaiiCruises.travel you can be assured that you will receive highly competetive rates that we have negotiated directly with the cruise lines on your behalf. In addition to our incredible LOW rates on Hawaiian cruises, HawaiiCruises.travel includes travel insurance for all of our clients to make sure your vacation investment is protected. Our agents provide top-notch customer service and they are here to answer all your questions and help you book the cruise to Hawaii best suited to your needs and desired itinerary. 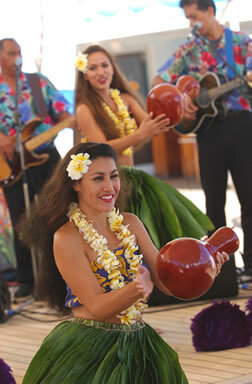 For more information about HawaiiCruises.travel, CLICK HERE. Book your cruise to Hawaii today online or by calling us at 1-877-721-8085. We’ll show you some of the premier golf courses in the world and the greatest beaches for surfing and snorkeling. You’ve got six islands to choose from — Kauai, Oahu, Molokai, Lanai, Maui, and the Big Island— all with their own unique climates, landscapes, and cultural activities. Let us book your next vacation in paradise!